Look out for a fantastic new compilation on the Trojan label which Robert Nicholls has been instrumental in putting together. In addition to compiling the tracks Robert has written special sleeve notes for this great collection of Mod Ska. 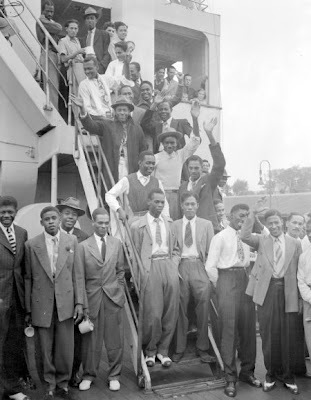 The original mod era encompassed the early days of London’s influx of black migrants from the West Indies which started in the 1950s following the initial arrival of the SS Windrush from Jamaica in 1948. By the early 1960s the black presence was progressively impacting London’s clublife. The fact that Mods were listening and dancing to black American music, attending shows and occasionally meeting visiting artists would have helped to diffuse any inherited racism. It was a time of rudimentary racial labeling and we did not make a fine distinction between the black American artists we listened to and the West Indian descendents we came in contact with. The young West Indians we met mostly were smartly dressed and with interests in nightlife and dancing similar to our own. Ian Hebditch states, “Mods were open-minded. Not narrow. There was a great degree of respect between the Mods and the West Indian Community. I personally found that. Within the Mod movement I don’t recollect any element of racism at all and by racism I mean anti-black feeling” (in Paolo Hewitt 2008, p. 82). Thus the racial profanities uttered in the movie Quadrophenia do not ring true. Although some Mods’ parents, even old brothers and sisters, might have been bigoted, as a group London Mods were not prejudiced and did not discuss racial issues much—so the statement by the “Sceneman” that The Scene Club “had a white’s only policy” stopped me in my tracks (modculture.co.uk). I don’t believe this was the Scene’s policy and it sounded strange to me, especially because, as time went by, I came to attend more and more black parties because they had better music and focused less on talking and more on dancing. Certainly Guy Stevens brought black entertainers such as Inez and Charlie Foxx to visit the club; in fact I got Charlie’s autograph. I also remember a black guy who was there on a regular basis, he probably had custodial connections, because he had access to the stockroom where the never-used chairs were stacked and he would sneak girls in there. But mostly it is true, black Americans and West Indians attended the Flamingo (and whites too) where Georgie Fame had a regular gig, while the Roaring Twenties on Carnaby Street was a predominantly black club that played Ska and later Reggae, although a few of us Ska loving Mods used to be allowed in. The Roaring Twenties Club was run by Count Suckle who later opened the Q Club which I attended in the early 1970s and which catered for Black American servicemen stationed in the U.K., and others. At the Roaring Twenties I witnessed something on more than one occasion that I never saw at the Q Club, a police raid, but such raids were conducted in a routine “see-nothing do-nothing” manner, probably by prearrangement. The lights would come on, and the hustlers would drop their joints and little stashes on the floor while the police did their rounds (mostly policewomen as I remember). The police neither searched nor arrested anyone and turned a blind eye to the little stashes scattered around, and when they left the hustlers simply picked them up. For North London Mods, interaction between white and black youth was most noticeable at the club above the Manor House pub in Harringay where a handful of young black men would dance with their white girlfriends. While some white blokes may have felt resentment they didn’t voice it and there was no overt friction, rather there a grudging admiration at the way the West Indians performed their stylish “hug-up” dances with their girlfriends. 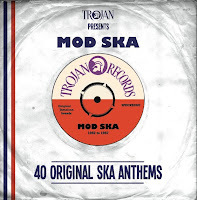 To stay ahead of the mainstream, the first-wave of Mods pursued different sounds, initially R&B and then moving onto Jamaican Ska, which we referred to as Blue-beat, because that was the name of a record label that much of it was on. The Blue Beat label was owned by Melodisc records and started up around 1962. Many of the biggest artists recorded for them including Prince Buster, Derrick Morgan and The Folks Brothers. An article titled “It’s the Blue-beat Craze,” appeared in The Record Mirror on 15 February, 1964. It defined Blue-beat as “a strictly Jamaican sound with a pulsating on-beat played on stop chords throbbing mercilessly through the disc. Most of the songs are down-to-earth items that don’t usually deal with love, and the tunes are strictly secondary to the beat. The article further explained, “The craze has been “in” with the Mods since last summer [i.e., 1963] because of the marvelous dance beat and of course has been bought by the West Indians in Britain for many years now.” We liked our Blue-beat raw and hard-edged. Prince Buster’s “Madness” was a big seller, as was his “Fire in the Wire” while his “Judge Dread” was always good for a laugh. The Skatalites’ instrumentals featuring Don Drummond on trombone were mod hits and their “Guns of Navarone” was heard all over town. Some early Maytals 45s such as “Matthew, Mark, Luke, and John” very popular as was a track that was simply referred to as “Dog War.” Blue-beat got a boost in late 1963 when “My Boy Lollipop” was a hit for Millie (Smalls) on Fontana, and she appeared on RSG singing this song. The Ska dance was extremely vigorous and used a forward leaning position, almost a crouch, whereby the bent knees served as springs bobbing up and down, while the arms pump up and down in front alternately. A dancer would frequently move to another spot, using a little jump to make the transition, and would then be facing another direction (or another dancing partner) while continuing to dance, it can be seen in the video that includes Prince Buster’s “Wash, Wash, My Troubles Away.” Around 1963 Tony Washington and the DC’s released “Show Me How” (to Milk a Cow)” (Sue WI327). Developed from a Louis Jordan tune it is now apparently one of the rarest 45s on the UK Sue label. Rumour has it that Tony Washington was in a relationship at the time with Sandra, one of the Scene Club DJs (pers. comm. Alvaro Rubio Romo, 1 July, 2009). There was also a “Milk the Cow” dance which was a bit comedic and a variation on the regular Ska dance whereby the straightened arms pumped up and down in front alternately—like milking a cow—in time to that blue-beat off-rhythm. I have since learned that “Milk the Cow” is a favorite among skinheads in Glasgow (pers. comm. April Prior, 3 July, 2009). We had a lot of affection for Jimmy Cliff and considered him a local lad. He was Jamaican, but had a flat in Kilburn, North London. During the early part of his career, he performed Ska, listen for example to his “King of Kings” and other of his early tunes. On 8 March 1966 at the Marquee “The explosive Jimmy Cliff” is billed along with The Spencer Davis Group. Derrick Morgan teamed up with Patsy Todd to record “Housewife’s Choice” and this track was popular, as was their version of The Impression’s “Gypsy Woman.” In time Sir Coxsone Dodd and Studio One emerged as a musical powerhouse as did Bryon Lee and the Dragonaires, and tracks such as The Maytals “That’s My Number” became Mod hits, as did other great cuts such as Prince Buster’s “Al Capone.” Rico Rodriguez and Laurel Aitkin both lived in London and I became friends with Rico, a Jamaican trombone player who carried on the heritage of the Late Don Drummond. Rico sometimes played with Prince Buster and Georgie Fame and and his “The Lion Talks” is great as is Laurel Aitkin's "Suffering Still." "Once inside we were able to buy curried goat and rice and Red Stripe lager (all at a cost of course!). The organizer made a little money and these were great nights featuring some fabulous music. 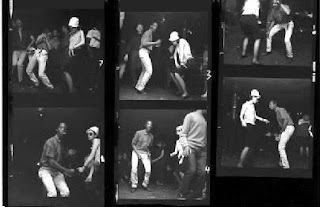 Blue-beat (early Ska) was the order of the day and it was at these parties we were introduced to the music of Derek and Patsy, Higgs and Wilson, Derrick Morgan, Laurel Aitken, The Foulks Bros and the mighty Prince Buster." I loved Rocksteady which came later, maybe in 1967, and included “I’m in a Dancing Mood” by Delroy Wilson and other songs. Compared to Ska it spread out the rhythm and allowed space for little trickling bass lines, the dance was sweet also, involving the arms outstretched sideways and little rhythmical dips during the bass passages. There was a small West Indian club in Camden Town we went to which was entered by a nondescript door in a wall that led to a basement in a row house. They tolerated us little white guys, essentially ignoring us, and there were a few white females, women rather than girls who were wooed in dance. The dancing which was mostly hug-up grinding variety was of the best quality. Of course such dance movements can be inspired free-form, but for ordinary mortals, in order to fall in step with the girl you were dancing with you would do two bounces on one knee not too fast, synchronized with her in time to the music, and then two bounces on the other knee, and repeat. Properly, your left hand held her right hand and your right hand rested on her waist, but if she felt comfortable with your movements you could move closer and drape your right arm around her back. DJ’s would occasionally interject grunts or nonsense syllables and other vocalizations, and drawl vocal encouragement in Jamaican patwa: “Yes,” “Do it like that,” “C’mon,” “Hold your baby close,” etc. Finally, I cannot list the blue-beat records the way I have listed American R&B records. Blue-beat Deejays were very competitive and secretive, and they’d scratch out, or paste over, the 45 rpm record labels, so you couldn’t discover who the artist was. However some Mods had great collections, I briefly dated a brunette with an apartment in Blackheath and she had the largest and greatest collection of Blue Beat 45s you can imagine. It by far outstripped the collections of any male I knew. 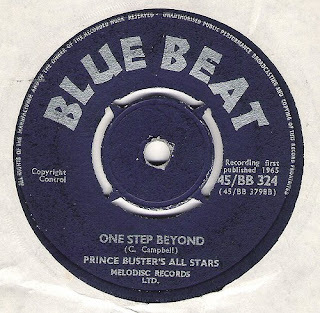 I didn't come fully on board until Al Capone by Prince Buster’s All Stars on the Blue Beat label and then Rocksteady emerged followed by embryonic reggae. such as early URoy: "Ace From Outer Space" for e.g. and "Chalice in the Palace," also "That's My Number" by the Maytals I think, or the seminal "Fire Corner" album in 1969 which I still have on cassette. This work is the copyright of Robert Nicholls, Ph.D. The views expressed are purely those of the author and are not attributable to any other person or institution. I know Rob would love to hear any feedback on this article. You can discuss it with him in the forum here or I will pass on any messages to him using the contact address.